The semi-finalists have been decided for the Bathroom Solutions Blackpool and Fylde Sunday Football Alliance’s coveted Gledhill Cup. The big four will come up against each other as Eleven Sports Media beat division two leaders The Mount 4-0 thanks to goals from Tyler Atack, Aaron Fleming, Morgan Walsh and Lee Catlow. Liam Forrest and Ash Robinson were on target as AFC Additions edged out division two leaders, The New Albert 2-1, Luke Noble with their consolation. Jordan Spedding scored a hat-trick to send his side, Highfield Social, through 4-3 against Bloomfield Brewhouse. Sam Dyer also scored with Mark Sloane, Chris Glynn and Dax Hoogerwerf on target for the visitors. Ma Kelly’s Showboat are also through following a walkover. In the Premier Division, Station Lytham hosted their local rivals, Exceptional Kitchens, and it was the visitors who took the lead with a Gareth Vickers header. 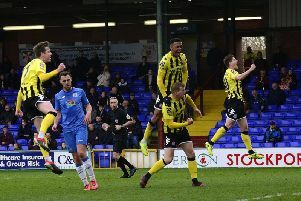 It looked like the hosts would not get past stand-in keeper Dan Ettrick, who pulled off a string of fine saves, until Nathan Young’s cross looped over him to level. In the second half, Ben McKay, Brad Hamer, Dan Jones and Tom Bell put the game beyond their opponents. In the First Division, Anchorsholme went top after goals from Jamie Lowther (2), Jack Shields (2), Aaran Smith, Daniel Chippendale, Luigi Farina and Darren Heaney gave them an 8-1 win at Wesham. The Excelsior had missed out on going top as they were edged out 2-1 by Westview, for whom Jonathan Gough and Darren Warren scored with David Ireland replying. In the Second Division, Layton Seniors took advantage of leaders, The Mount, being in cup action to close the gap on them to four points. They edged out Kirkham Town 2-1 despite Leyton Davies’ goal. Connor Burns, Matty Grime, Whyatt Riley and Ashley Casey all scored as AFC Lane Ends beat Highlands 4-1 and leapfrogged them into third place, Lewis Loftus grabbing the consolation. Andrew Hargreaves, Chris Bardsley and Ryan wellings found the net as Little Black Pug beat Fylde Rangers 3-1 for whom Jack Hammond scored. Goals from Josh Wileman, Mike Deery, Danny Hadgraft and Daniel Summer gave Marshall Court a 4-1 win against Blackpool Elite, Jack Pope replying. Table-topping Thornton Cleveleys came out on top in a five-goal thriller against Coppull United to maintain their lead in the West Lancashire Football League Premier Division. They had to come from a goal down to secure a 3-2 win after Liam Thompson netted early on for Coppull. But they hit back shortly after the interval through Alistair Palmer, before taking a 3-1 lead with two goals in the final 10 minutes courtesy of Jake Walmsley and Jordan Spedding. Ben Breakell netted an injury-time consolation for Coppull but it wasn’t enough to stop Thornton claiming the three points which keeps them four points ahead. Blackpool Wren Rovers lost further ground with a 3-0 defeat at second-placed Burscough Richmond. Nathan Martland, Peter Armitage and Phil Quirk were the hosts’ goalscorers. Adam Sharrocks scored for Poulton as they drew 1-1 with Southport Hesketh, Jesse Fowling scoring for the away side. In Division One, Lytham Town were beaten 2-0 at home to CMB, leaving them in sixth place in the division. Thomas Healy and Jack Francis netted CMB’s goals. Bottom-of-the-table Wyre Villa suffered another defeat as they also lost 2-0, Jay Turner and Bailey Carlos scoring the goals for Kendal County. Despite winning three games this season, Wyre Villa remain on zero points having been deducted seven points for fielding ineligible players.